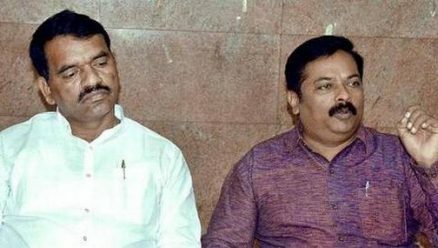 MLAs Abhay Patil and Anil Benake have urged the State government to release ₹ 200 crore for repair of roads in the city immediately. At a joint press meet in Belagavi on Thursday, the BJP leaders representing the two Assembly constituencies in the city said that they would lead a delegation to the Chief Minister H.D. Kumaraswamy seeking allocation. “Poor quality of roads is making life difficult for the city’s residents. Mahadwar Road and Congress Road that were built in the last few months have also developed huge potholes,” Mr. Patil said. He alleged that Belagavi City Corporation officials were hesitant in taking action against contractors as they had colluded with them. “Officials have awarded contracts and passed contractors bills without due diligence. Now that the roads are heavily damaged, they are giving lame excuses, including heavy rain,’’ he said. He also alleged that corporation engineers had prepared tenders without putting the responsibility of maintaining the roads on the contractors. “If the State government does not release funds immediately, we will start an agitation. We will oppose the State government’s attempts to hold the winter session of the Assembly in Belagavi,’’ Mr. Benake said. They suspected that there were large-scale irregularities in the award of the contract for road construction in the city. They urged the State government to initiate an inquiry against officials involved in awarding tenders and in the quality inspection of roads. “The State government should lodge criminal cases against officers and blacklist the contractors. I will make sure that the officials face action. I will not be satisfied just with the transfer of officials,’’ Mr. Patil said. Mr. Benake alleged that the former MLA Firoze Sait was involved in the irregularities. He alleged that officials had colluded with Mr. Sait and other elected representatives and allowed poor quality work against considerations, he said. Details of projects where low quality work was carried out had been given to Deputy Commissioner S. Ziyaullah for necessary action, Mr. Benake said.